Is your enterprise required to keep your Azure PCI compliant? If so, then you must know how stressful it can be to provide evidence that the customer cardholder data you store in the cloud is handled according to the requirements of the Payment Card Industry Data Security Standard (PCI DSS). 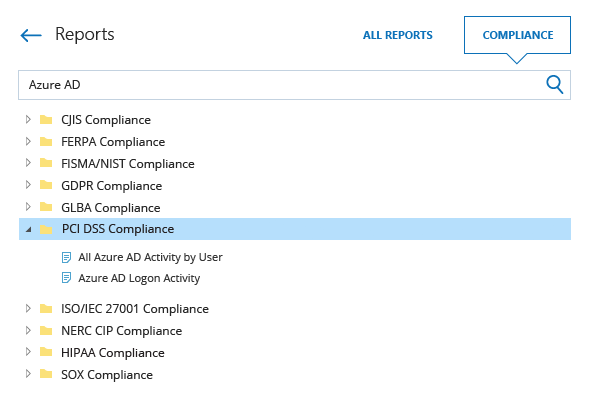 To ensure data security and pass attestation of compliance (AOC), you need to start by monitoring sign-in activity and all changes to your Microsoft Azure AD configuration, which controls entry to your cloud directory service. Azure Active Directory (AD) is the gateways to the Microsoft Azure platform and its integrated cloud services. Securing Azure AD is critical for maintaining cloud services operations, ensuring information security and passing payment card industry audit checks. Therefore, you need to protect it from unauthorized configuration changes and unwarranted logins. Microsoft Trust Center is a one-stop shop that helps you understand compliance in the Microsoft cloud and get targeted information. Stay on top of sign-in attempts in your Azure AD to spot attacks, inappropriate access to sensitive data and privilege abuse. Streamline reporting with detailed predefined reports, including pre-built compliance reports mapped to the most common regulatory standards, such as PCI DSS, CJIS, FERPA, FISMA/NIST, GDPR, GLBA, HIPAA, ISO/IEC 27001 and SOX. Identify aberrant activity faster by subscribing yourself or security officers to the reports that each of you needs. Chase down suspicious actions and get to the root cause of security incidents in minutes with the Google-like interactive search. Be the first to know about critical changes or access attempts across your Azure AD environment with custom alerts. Store your consolidated Azure AD logs for over 10 years in the cost-effective two-tiered storage (SQL Server database + file-based) and access them any time you need to prepare for an upcoming audit check.